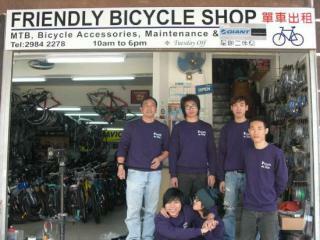 The Friendly Bicycle Shop is one of two shops in Mui Wo (also known as Silvermine Bay) on Lantau Island. Mui Wo is the starting point of the Chi Ma Wan Peninsular XC ride, so this shop, located just around the corner from McDonald's can provide last minute essentials and tune-ups . Mui Wo is also a convenient place for residents of Discovery Bay to have their bikes serviced - it is much easier to get to on the ferry than taking your bike to any of the other shops. The shop has a decent range of complete bikes at various price points (brands include Scott, Merida, and Giant). It does not stock a huge range of high-end bling, but has a decent range of good quality essentials such as Shimano XT derailleurs, chains, cables, pedals and cleats, clothing, Camelbaks and protective gear. Where Friendly really excels is in its service - the guys running the shop are generally very helpful, take pride in their work and try hard to satisfy their customers.